S and T transferred care to me in their second trimester after being unhappy with their original care provider. 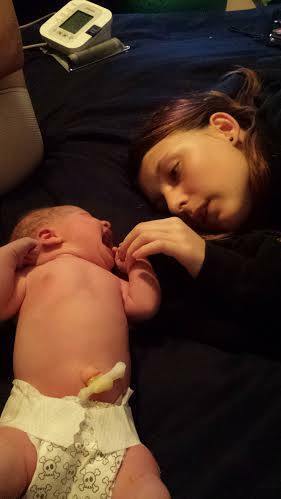 This was S’s fourth baby, and her first home birth. The whole family, including the three older sisters, were very excited to be welcoming their new sibling at home. At 38.2 weeks, S sent me a text. She knew I had been at another birth. I had just walked into my house and sat down. She said she felt like today was the day. Her surges were all over the place still, but definitely getting stronger and longer. It was around 630pm. We talked about eating a good meal, staying hydrated and moving around. Around 8pm, S text that they got the younger girls to bed and were going to go for a walk and see what it did for the surges. I told S I was going to try to get a little nap, but to update me often since her last labor was six hours. Photo they captured of the sunset while on their labor walk. S text me close to 9 that the surges definitely had picked up during the walk. She was so overjoyed that the labor journey had begun. She told me she was going to bake cookies and would let me know when she was ready for me to come. I heard from her a little later, and she still said it was not time to come yet. A little after 10pm, T texts that the contractions are very frequent and hard, and that S was wanting me to come. My drive was about an hour. I was already dressed, so it only took a moment or two for me to get out the door. I arrived at their house a little after 11. This awesome note on the door. I think every woman needs a sign like this at the door. I walked in the door to a very moany, primal S, laboring beautifully in the birth pool with T sitting next to her. The three big sisters around the birth pool. Doula stated her water had just broken a moment or two earlier. S was feeling very pushy. We scrambled to quickly get the oxygen set up and gloves on. Within minutes of walking in, the baby was crowning. The head was soon out. The baby had a nuchal cord wrapped around her head twice. It was too snug to unloop. With the next surge, S birthed the rest of her baby, and we somersaulted the sweet baby out of her cord. Sweet Fern was brought to mom’s chest. Fern latched to the breast soon after the birth, no issues. Fern is so loved by her three big sisters.